Find artworks, auction results, sale prices and pictures of Lorenzo Mattieli at auctions worldwide. 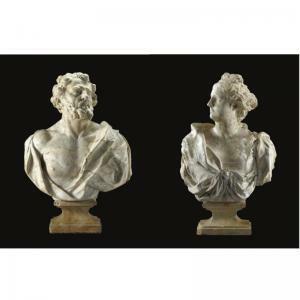 These two impressive busts, carved in the unusual marble from Vicenza known as Biancone di Pove, are important new additions to the oeuvre of Lorenzo Mattielli. 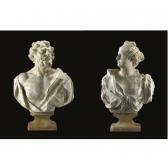 Published by Massimo de Grassi in 2005, these busts may be dated on stylistic grounds between 1705 and 1710, around the time that Mattielli left Italy to work in Vienna. A closely comparable bust representing Sacerdotessa was sold in these rooms in July 2006, lot 135, and may have been, together with the present pair, part of a larger series of busts. However, the iconography of the present pair is not obvious. De Grassi identifies the man as a philosopher, such as Heraclitus or Democritus, and the female bust as an ideal portrait of a Roman noblewoman. The absence of any attributes makes a more specific identification impossible. The bust of a philosopher may be most closely compared with Mattielli's figures of Colman and Leopold on the façade of the Abbey in Melk and the two figures of San Chiliano and San Massimiliano on the high altar of the Abbey church in Lambach. The treatment of the hair and decoration on the noblewoman is identical to the Sacerdotessa and these aspects are repeated in Mattielli's Sphinx in the Hetzendorf Palace in Vienna made in 1716. The use of the distinctive biancone di pove marble surely indicates that these busts were made for a palace in the Vicentino from where the stone originates. Lorenzo Mattielli was born in Vicenza in 1687 and trained in Venice under Orazio Marinali. In a document of January 1706 he is recorded as a witness at the marriage of his fellow sculptor Giacomo Sasseti to Anna Marinali, daughter of Orazio, only reappearing again in a document in Vienna in 1711. The Imperial Court in Vienna was attracting large numbers of Italian trained sculptors early in the eighteenth century and it was in Vienna that Mattielli made his reputation. Following on his success in Vienna he moved to Dresden where he also undertook a number of ecclesiastical commissions as well as the notable Neptune Fountain (1741-46) in the garden of the Marcolini palace.